Millions of people use Google. Students, authors, and teachers are among the few that conduct daily research. 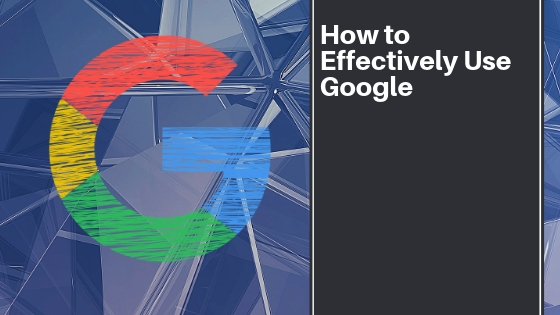 There are ways to effectively use Google to sharpen your search results. It’s as simple as using these methods. “ ”: Exact Phrase. Placing quotations around a phrase tells Google to only search that phrase. Let’s say you want to search football cards. It should appear like this in Google search: “football cards.” Without quotations — results for football, cards or both will appear on your screen. Those websites that only use the phrase “football cards,” however, will be the ones that Google delivers to you. –: Exclude Words. This excludes websites which contain specific words/phrases. For instance: the Google search may be: dog breeds – golden retrievers. Your search results will exclude any search result that is not related to golden retrievers. This technique will likely sharpen how you search. You’re only getting the information which you seek. It’s like cutting the weeds down just to get through the forest. You don’t need non-relevant information, but just the facts. ~: Similar Words. This allows you to search for a word and all of its synonyms. You may search for ~beautiful, for instance, and it would provide all synonyms for that word. You will not get results for any variations of the word, which is an effective way to stay on task. Using this symbol (~) before the word brings up synonyms and definitions for the word. OR: Multiple words. This search technique helps you narrow your search by searching for either word. Searching for non-fiction OR memoir, for instance, will bring up results for non-fiction books which are memoirs. It cuts out the rest of the non-fiction books entirely, giving you the opportunity to search for exactly what you want. This makes your results more directly to the point. …: Numerical ranges. Do you need to search for years or prices? This is the search technique that works best for it. I did a simple search for Ronald Reagan 1981…1989. All the information on Reagan pertaining to those years is at your fingertips. There is no information about anything else related to those years, such as pop culture of world events. This Google search method is going to assist you in researching so much better. define: This shows you the definitions of words. Type this into Google: “define: coffee.” Doing this automatically brings up definitions for coffee. It may be Google’s definition, alongside many of the online dictionaries. If you’re studying for an exam or writing books, researching definitions this way is useful and efficient. It gives you variations of the definition. Some of the definitions may be worded in a complicated way, while others may be simplified English. Often times, too, the dictionaries will include synonyms of the word. What other Google search methods do you use? Leave a comment to share them with others.